Whilst I alone use the entire bathroom cabinet for my skincare and have a chest of drawers dedicated to all my beauty products, there is one category of product that both me and the Husband both share a love for and that is perfumes. In all honesty his obsession with them is far greater than mine, with a collection to rival my makeup stash! 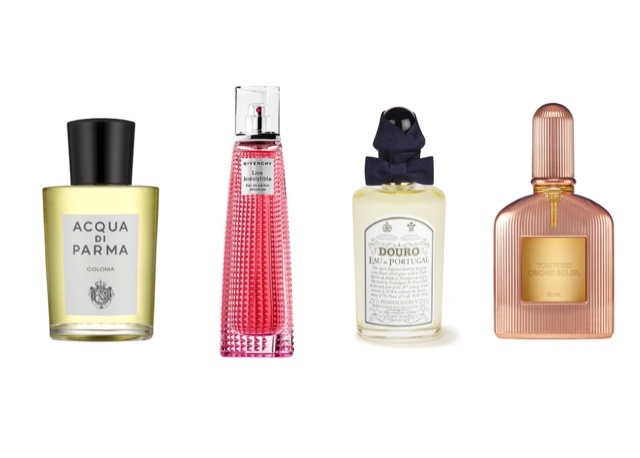 And so I thought it would be nice to share with you what perfumes we have on our wish lists right now...(also timely for us to hint to each other what we would love to be gifted for 'Eid, haha!). Hubby is definitely more into fine fragrances and niche scents than I am. He has a huge collection of attar/ittar fragrance oils and so when I showed him Clive Christian Perfume Sets* he was drooling over each and every scent. This luxury perfume brand focuses on the story of each perfume and the emotions they evoke by using precious and rare ingredients, to surprise even the most seasoned perfume lover with something unique. These little vials of fragrance come packaged in beautiful bottles and luxury gift wrapping, and each set comes in a female version and a male version. If the Husband is really nice to me, I may just have to treat him to one of these. I recently got him a bottle Pengaligon's Endymion as part of my Latest In Beauty box and we've both fallen in love with it. So it wasn't long before Hubby was on their site looking at their other scents where he came across Penhaligon Douro Cologne. It has citrus head notes, neroli at the heart and musk and sandalwood at the base making it a scent even I am curious and excited to smell. Another one on the wish list is Acqua Di Parma Colonia which in all honesty is one I want for him more than he wants for himself ;) I love citrus scents and again this one has notes of lemon, orange and bergamot, with a heart of verbena and rose and a woody base. It just sounds like something I would enjoying smelling around me. Haha! Also the bottle is stunning which always helps sway me. For over a decade now, my favourite perfume has been Givenchy Very Irresistible and I've owned it in its various versions over the years. When they first released Live Irresistible Hubby treated me to a bottle so when I heard of this newer version I have been dropping hints about it ever since. Givenchy Live Irresistible Delicieuse is described as a delicious, as the name would suggest, and mouth-watering scent and I'm all for that. I mean a scent that opens with the scent of cake is meant for me surely. It also has hints of cherry, vanilla and caramel, followed by orange and rose, ending with warm tonka bean. I can't stress enough how much I need this in my life! I just generally love sweet scents even florals but recently I am all about that vanilla and caramel sweet edible scent vibe basically. I have wanted to get my hands on a bottle of Philosophy Fresh Cream for what feels like ages now. Vanilla, macadamia, spun sugar, whipped cream, almond blossom, vanilla milk and tonka bean - can you blame me? One that I want that's more floral and not really the kind of scent I steer towards is Tom Ford Orchid Soleil, which is meant to "capture the seductive warmth and reflective bare skin of the Tom Ford woman". I have no idea what it means to be a Tom Ford woman but if its the kind of woman that would buy a perfume based 90% on how pretty and rose gold the bottle is, then that must be me! I hope you guys enjoyed reading about the perfumes on our wish lists. I'm thinking of turning this 'His & Hers' into a series for my blog. Let me know if you guys think that's a cool idea and what kind of things you'd love to see me post in that series. *Sponsored post. All opinions are my own and 100% honest. See my Disclaimers for more information.